You see, Waldemar had been suspected of being a werewolf by the local villagers and one night one of them had plucked up the courage to shoot him in the heart with two silver bullets. Believing the werewolf threat over the villagers allow a pair of coroners to inspect the body. The pair, being educated city folk, do not believe in werewolves even though they are familiar with the legends. One of them decides to prove that Waldemar was no werewolf by pulling out the silver bullets because it is believed that removing the bullets from a werewolf’s body would cause them to come back to life. Sure enough once the bullets are gone Waldemar springs back to life and since it happens to be a full moon he slays the coroners before escaping off into the night. Now back home in his villa with two vary attractive house guests, Waldemar agrees to help them find the tomb of princess Wandessa, though unknown to Elvira and Genevieve, Waldemar has his own reasons for seeking out the tomb. As it turns out Waldemar needs to find the tomb in order to find the silver cross within which was said to have killed the princess by being thrust inside her heart. Waldemar needs it because apparently the only way he himself can be killed and finally put to rest is to be staked by the silver cross himself. When the tomb is finally found and with it the cross inside, Waldemar gives the cross to Elvira as a gift in hopes of making her fall in love with him, for only someone who loves him can put him to rest. Unfortunately removing the cross from the chest of princess Wandessa has serious consequences as the vampire princess returns from the grave. It’s not long before Genevieve finds herself the victim of the undead princess and a vampire herself. Together they haunt the village, feeding on the locals. Elvira insists that she and Waldemar must stop the vampire threat but when Waldemar confides in her that he is a werewolf Elvira is no longer sure just who the real threat really is. You would imagine that a movie that has so much going on would be quite exciting but you would be wrong. In fact I do believe this movie might even qualify as a cure for insomnia. 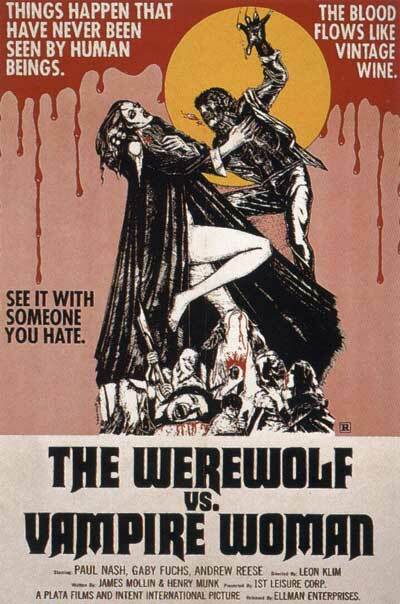 This poorly dubbed movie from Spain takes 70’s horror cheese to a whole new level and from what I’ve uncovered on the web there are about eight more of these films which follow the trials and tribulations of Waldemar the Werewolf.